Can just a few hours of expert fundraising counsel make a difference in the life of a nonprofit? In 2014, the executive director of The Assisi Foundation of Memphis, Inc., purchased 90 hours of fundraising counsel on behalf of six mid-South nonprofits, ranging in focus from urban farming to performing arts. Each organization received five to 20 hours of consulting time with fund development experts Saad&Shaw. 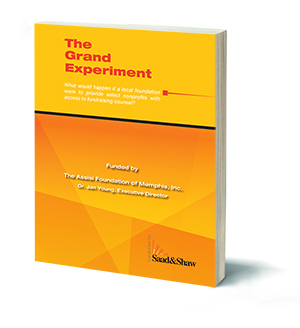 The ensuing Grand Experiment revealed the impact that a micro-consulting program can have upon nonprofits as they launch a fundraising campaign, develop a strategic business plan, or secure a major grant — with just five to 20 hours of non-monetary technical assistance. The payoff? More than $1.5 million in grants and in-kind resources to date! Written for both funders and nonprofit leaders, this book documents the process of selecting and advising the recipient nonprofits, the immediate and projected outcomes, and lessons learned.